The day went by quite fast, and then it was time for Satsang... i had no idea what that meant... but we all had dinner and gathered together in the Meditation Hall (then just newly built) and some people started singing some bhajans... which as a devout Parsi, i totally rejected :)... I remember thinking, we dont do Bhajans!!! Its g8 listening to your guru stories :) .. please keep posting em..
Well i truely hope its a series..:) i am sure you will have looooooooooooooooooot of experiences rather miracles!!! Looking forward.. to all those...!! EE but there is a funny part of things..! i mean imagning you in a young age as i read through the lines.. wow.. i saw a sweet undiminished smile like krishna.. i mean.. the "naughty" touch to it..! when you meant that Guruji said.. A great great teacher!! Love you dear bawa.. love u so much! Oh man, I got goosebumps at that last paragraph... fantastic story! Bau your blog is just superb, I am reading it almost daily. Your first experience with Guruji was just awesome, fabulous, enchanting. Bau your blog is a big khajana for all of us. This is so cute! !I was waiting for just this :)! Thanks for sharing this amazing Guru story Bau!!!!!!!!! Looking forward for more of your and Dinesh Bhaiya's experiences. thanx alot bau for sharing your experience.......i was waiting for this 1 to come. it felt good to read it out coz it made me feel that we all have more or less the same experience wid His Holiness. i really didnt looked at it as an accident but as an humbling experience for me. coz i know dat his grace has only saved all of us frm dat hair raisin incident. I mean if it wudnt hav been his grace atleast few of us wud atleast be bleeding. finally the most awaited part arrived!!! it was reallyyyyyyyy beautiful & memorable moment for you naaaah?????????? 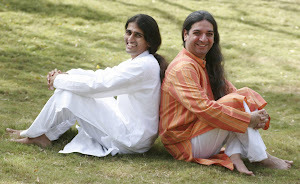 Luv u n Guruji N Dinesh sir toooooooooooooooooooooooooo lottttttttttttttt! wow I mean "WOW" . Its not often that one gets such intimate sharing from a senior teacher - this is usually reserved for advanced courses/DSNs or intimate volunteer meetings . Felt beautiful after reading it. When was this Bawa ? he definitely meant u. remember i was the only one who did not know who this revered bawa was in your TTC1 class. I had to be from Guyana. i went through this again.. and completely remember guruji walking on the stage during pds mumbai 2006..
he really glides kind of skates on the stage.. so smoothh and effortless.. even michael jackson would find himself embarrassed while moon walking! oh what a lovely article. and so touchin'. the first meetin b/w the Guru and the disciple, amazing Bawa. simply amazing. and it has reallly made me emotional. We all love Guruji so much...and He does so much for us. I wonder whatever I was doin' before AOL. now we all live in such a protected environment filled with such love and warmth. i feel it. and i love it. and the Ashram indeed is dear to me as my home. Of course guruji was referring to you,bau!